Pheasant is often overlooked nowadays. This game fowl has a unique flavor that is perfect on the grill. 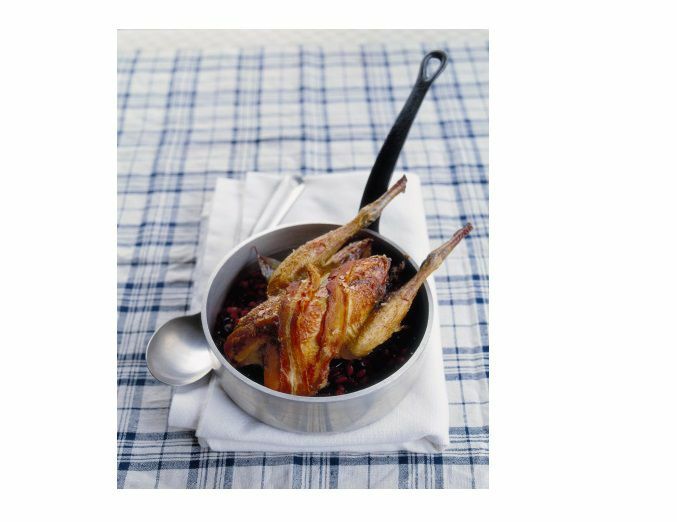 What you have to remember is that Pheasant, like most game, has a low-fat content and can dry out quickly. This is why many pheasant recipes call for larding. Larding is a cooking process where you add fat to the meat to keep it moist and flavorful. Regardless of how you cook pheasant, it has a wonderful flavor of its own so don't overdo it. These days you can buy your pheasant wild or farm-raised, which is more common. The farm raised variety has a little more fat to it and a milder flavor. Most pheasant you buy these days is going to be cleaned and prepared which leaves the consumer unaware of if the pheasant has been "hung" or not. Traditionally, fresh pheasant is hung up to "age" for a few days. One of the reasons for doing this is to allow the oils in the feathers to travel into the meat adding flavor and moisture. Pheasant is low in fat and will dry out if proper measures aren't taken to prevent this. The traditional method of larding is to wrap pheasant in bacon (or pancetta if you are looking for something more Italian). As the bacon cooks, it releases fat which keeps the meat of the pheasant basted. Another method of larding is to simply baste your game bird with oil-based sauces or marinades. This will also add moisture. Remember there is a difference between adding water to meat and adding fat. Fat is perfect for very lean meats while water is better for fatty meats. Pheasant, once prepared, should be cooked pretty similarly to chicken. Pheasants tend to be a little smaller than many chickens so the cooking time will be a little less. A whole pheasant is perfect for the rotisserie and pheasant breasts are a great alternative to chicken breasts since pheasant has a much better flavor. Since pheasant is relatively small the smoking times are not that long. A typical pheasant can be smoked in 2 to 3 hours at a smoking temperature around 250 F. Use a slightly higher temperature since pheasant is as prone to bacteria as turkey. Using a higher temperature helps to reduce the risk of contamination.